I actually had a dream about this apron the other day (must have seen one somewhere) and decided it was just the thing for September. This one is almost too simple to tutorial but I will at least let you know what I did. 1. Cut the leg off an old pair of jeans. Cut up the inside seam and open the pant leg out flat. 2. Cut the top of the apron the width you want for your chest. I used 12". Then I tapered that down to the width at the waist. 3. Fold the pant leg in half now and trim up all the edges evenly. You will also want to clean up the bottom of the apron with a nice curve. 4. Now trim out all the edges of the sides and bottom with the Bias tape. I used wide double fold bias binding. I used the 3 stitch zig-zag just for fun. 5. Now add your straps. I used a grommet press because there was one on my counter top, just begging me to use it. I then added the twill tape. 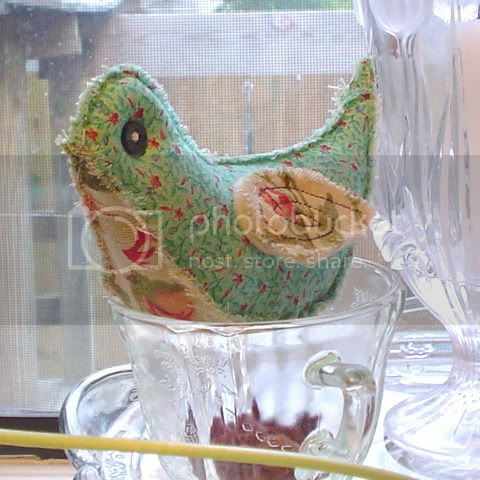 You can use ribbon or fabric or what ever you want. Just make sure you make them long enough to tie at the neck and waist. Now you are done! Too cute and too fun! I love this!! I also picture this with the jeans pockets in front with a creature peeping up behind one of the pockets (kinda like with your April apron). Too FABULOUS!! I think I might add a pocket. I have some spare pockets left over from other pojects but I can't remember where I put them! When I do I will add pocket. 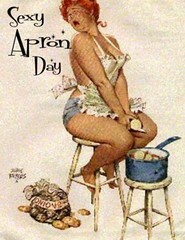 I really don't like my aprons to be pocketless. That is so cool! I'm going to try this with my kids' old jeans to make kid-sized ones. Love it! Love this idea. 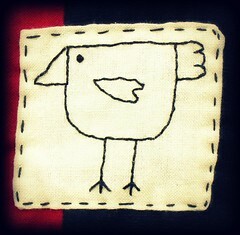 I'm going to try to make a child's version. Lucy, I found your tutorial linked on My Half of the Brain tutorial blog!! How cool! Hi! I have linked your tutorial in my blog, in my "Sunday's Project". It's an entry I write once a week, on Sunday, with easy and fast ideas or tutorials to do during the weekend. I have also used one of your photos, giving credit, of course, but if some of this disturb you, I will remove it. This is great! I don't like throwing things away so I have a bag of jeans waiting to be re-purposed. This is just the perfect thing. A wonderful project that the kids can help me with! Thanks so much! Your tutorials are great I love them all! I just found this page! This is a wonderful idea! I would love to wear aprons since I'm constantly getting my clothes soaking wet when I do the dishes, but regular aprons are made from such thin cotton that I don't bother. But hopefully jeans would be thick enough so that, even though the apron might get wet, the wetness wouldn't go all the way through to my clothes. Now to find a pair of jeans no one wears anymore! LOL! And after you cut off both legs, you can use the rest of the jeans for a bag (just sew the bottom together) I have a jeans bag, but I didn't know what to do with the legs! Thank you for posting this! I stumbled across your blog a few weeks ago. I love it! I thought you might like to see my spin on your great idea. www.sappblog.blogspot.com. Thank you. I love it, and posted it on my blog. PS I love your play list. Love all the photos and your teaching style. 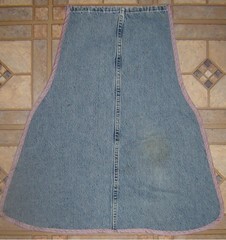 I am a an apron lover as well as love to revamp old jeans. Thanks for more things to do with my huge pile of denim. 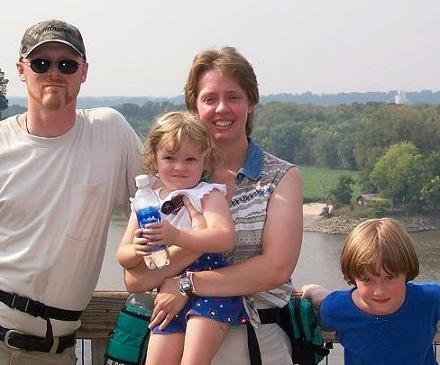 My Husband lost a lot of weight cause of Bladder Cancer. So, I got a lot old jeans of his (sure wish they where my jeans) I was to to attempt a purse with them, but now I really am going to use it for the Apron, I work out in the garden and always ruin my clothes, even thoough they are old. Again Great Idea. Thank you. "DI"
Thank you! I am always happy to hear that people have found this tute useful. 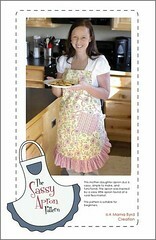 My favorite thing about this apron and the other Jeans aprons I make is that they keep you so clean. I love how thick they are. I can wipe sticky wet hands from cooking or gardening and know that I am safe. How did you tie the twill tape behind the grommet?? I can't figure it out unless my grommets are just too big, the knots keep coming out and I dont want to tie 20 knots, well cause then it gets messy. I used the heavy 1" twill tape so one big knot pretty much did it for me. You could loop the end back up and stitch it to itself and not do a knot at all. On one of the aprons I did recently I didn't put grommets at the top, just at the sides and I stitched the ties to the top of the apron. Love this idea! I really needed these instructions, thanks for sharing. I love it! 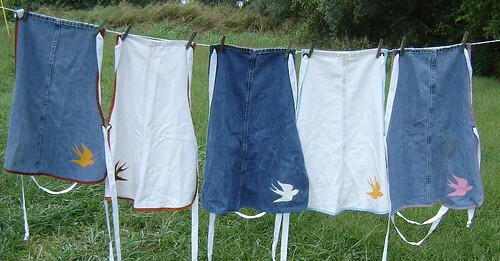 My boys made aprons one day that was so like these. We just kinda said "hey, this looks like an apron". 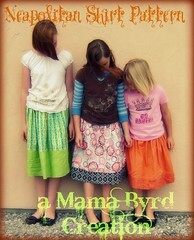 I helped them to make their aprons "no sew" aprons. 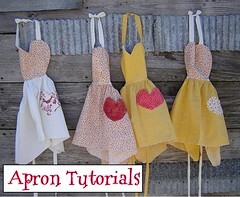 What a neat idea for an apron! I love it. Thank you for sharing this! Thank you for sharing this lovely project. 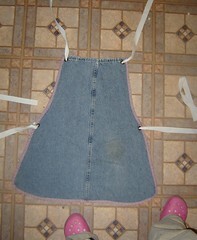 Thank you for this GREAT pattern for reusing jeans into a wonderful apron. I've featured it on my Squidoo page Reusing Household Items For Green Crafts and blogged it on Squidology, The Chronicles Of A Giant Squid. Completely gorgeous and adorable! Now I have something cool I can do with my old jeans! WOW! what a neat idea! Do you mind if I post a link to it on my blog? 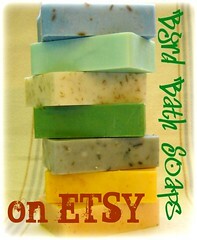 very cute and eco friendly! Now I'm eyeballing my jeans! 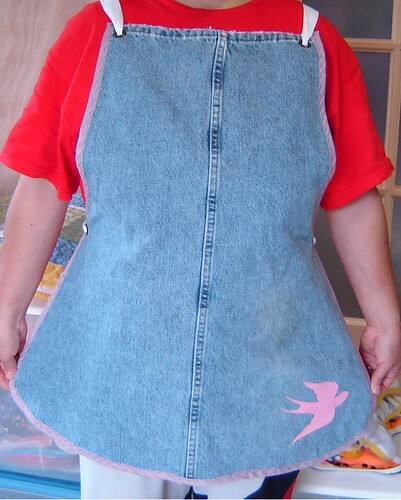 A denim jean apron, what a bright idea! 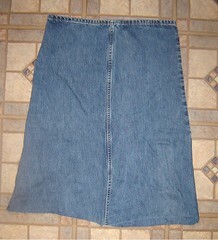 I'll make this one with my old jeans as soon as possible! You know i was so lucky to have this article read at your blog, i too had a piece of old pant which i can turn in to a good apron i think, thank you for this great tutorial and with all these photos it explains well.